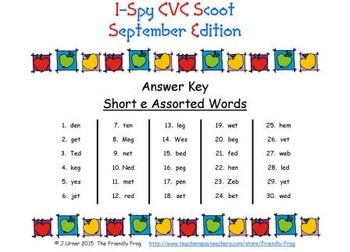 The focus of this activity is on TINY CVC words with the letter sound /e/ in the middle. 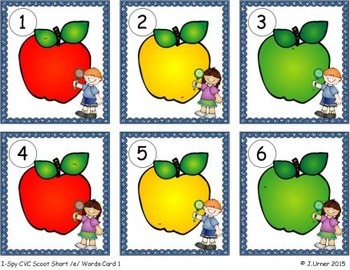 Included are thirty (30) cards with an apple theme. In addition to the card set, you will need a class set of magnifying glasses (one for each child). Game Play: Pass out the recording sheets and pencils first. Instruct the students to write their names at the top of their pages. Next, inform the students that they will also be receiving a magnifying glass. When they receive it, they are NOT to use it yet. Instead, they should hold it in their hand, with their hand raised over their head. 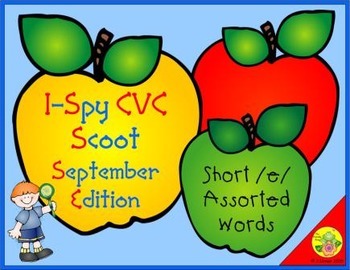 When you say, “Ready begin,” the students will use their magnifying glass to locate the tiny word hidden on the apple and copy it onto the corresponding space on their worksheets. For example, if a child has card #14, s/he should record the word from their card onto the line next to #14 on their paper. 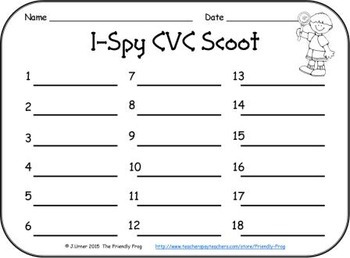 When all the students have finished writing their words, you will say, “Scoot.” The children will leave their pencils and magnifying glasses on the table, and carry ONLY their papers with them to the next seat. Continue playing until each student has had the opportunity to visit and record the words on each table. Be sure to review the words with your class when you have finished the game. Enjoy this activity.